I’m surprised you don’t want to take full ownership of the paint protection... even on top of the shield? Nah, time to let the checkbook do the detailing on this one. According to Esoteric, actual coating of the PPF with dedicated product not really necessary and in some cases, the built in hydrophobic layer of the film doesn`t lend itself well to being coated over, depending on the coating used. Just an occasional hit with a topper/booster and should be good to go. I will be taking care of some items like coating the glass, interior protection and such so not totally un-involved. Didn`t wanna mess with pulling, cleaning, prepping and coating wheels `cuz it`s kinda a pain on jack stands so having them handle that as well. And to be quite honest, kinda tired of car stuff right now...looking forward to a bit of a break before I have to re-do our personal cars this Spring/Summer. DYNOshield provides you with unparalleled top-coated paint protection film technology for those seeking the best-performing film on the market. Our nano-glass top coat is bonded to the film at a molecular level during manufacturing virtually eliminating the need for waxes or after-market top coatings. DYNOshield is unique in the market because of STEK`s combination of an extremely hydrophobic top coating plus self-healing properties for correction of light surface scratches. Our top coat combined with UV-resistant anti-yellowing adhesives results in unmatched clarity and gloss plus improved puncture resistance. DYNOshield – the best automotive paint protection available from one of the worlds’ leading paint protection film manufacturers. - DYNOshield paint protection film is warrantied for 10 Years against delamination, yellowing, bubbling and cracking. Nah, time to let the checkbook do the detailing on this one...Part of the fun of this whole experience is having the pro`s do most of the work...And to be quite honest, kinda tired of car stuff right now...looking forward to a bit of a break before I have to re-do our personal cars this Spring/Summer. I`m glad to hear you`re doing it a way that`ll be fun for you. That DYNOshield sounds interesting! Congrats! I’m not sure if you are familiar with obsessed garage but he did what you are doing with a 911 at esoteric and videoed the process. Esoteric is quite impressive in their operation, I’m sure you will be pleased. Keep us updated on the stek film, I’m looking at ppf for a gt350 I’m getting and am not sure if suntek ultra with a coating on top of stek will perform better. Saw those vids, good stuff. Really interested to see how life with PPF is as opposed to a coating. Hopefully lives up to its reputation. Beautiful car! I`m excited for you. I slapped some zipang on my suntek ultra ppf lol. From what I remember the water behavior is still better with a coating than without. DYNOshield sounds promising so the booster approach might be perfect. Well, took a shot and went with a dealer not based solely on price alone but rather a combination of things that I thought would provide the most satisfactory and entertaining` overall experience. Unfortunately, oftentimes these `great` ideas of mine end up on my list of things that "Seemed like a good idea at the time..." due to reality being at odds with my somewhat optimistic theoretical thoughts of how things `should` work. Sometimes the `glass half-full` ends up being `half-empty` after all. 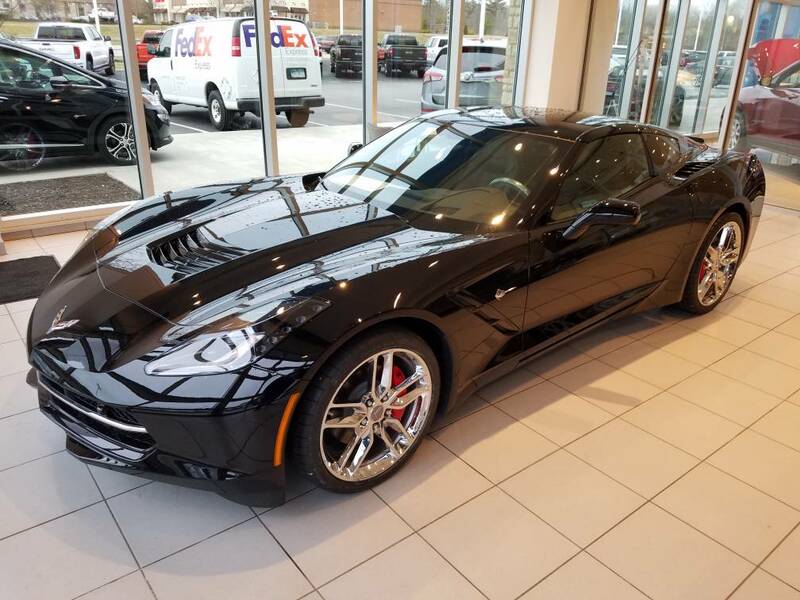 With that in mind, yesterday we hauled ourselves outta bed at 6am and drove 150 miles to be at Chesrown Chevrolet`s door at 9am to finalize the paperwork and take delivery of Margaret`s new 2019 Corvette. After that we drove it over to Esoteric Fine Auto Finishing where we left it to have the windows tinted, STEK DynoShield applied to the entire car and the wheels pulled, prepped and coated with Kamikaze Stance Rim Coating. At the end of the day, nearly 13hrs later, we had one of the most overall entertaining days in my recent memory. Both organizations probably took a hit on overall productivity yesterday as the hospitality (and associated time) they provided to us were beyond compare. Dunno about them, but we were just having SO much fun at both places that I was just unable to merely complete the task at hand in a timely manner and run out the door. At Chesrown we met the entire dealership family, got an in-depth tour of the facility, the obligatory introduction to the cars features but mostly just had a great time talking with everyone about everything from how their dealership runs, the auto industry in general, cars in general and any other obscure but interesting-to-me things that mighta popped into my head. While they were prepared for our arrival and we coulda probably finalized everything and been on our way in 30 minutes, we ended up spending about 2.5hrs there because time gets away from ya when you`re having so much fun. Oh yeah, and we signed some papers and wrote a check too...almost forgot about that part. We musta seemed like an interesting couple as Margaret was nicely dressed, appropriately accessorized with bits of St Patrick`s Day green and me, well I was wearing torn jeans and a Mr. Bubble t-shirt. Opposites attract, I guess. Got a chance to drive the car for about 30 miles on the way Esoteric and I think its gonna be a winner for us. The controllable dual-mode exhaust is a hoot, it`s pretty comfortable for both Margaret and I and it`s just overall a nice step up from our 2004 Corvette for us; priorities change as we age and I think we`releaning more to `Tour` as opposed to strictly `Sport` these days. Rides nicer in Tour mode, steering is lighter when set to that mode and, for me anyway, the view through the windshield while driving is somewhat less `faith based` than it was with our previous model; I was just never quite sure exactly where the corners of that car were w respect immovable objects. I don`t see myself laying on the garage floor bolting on longtube headers, cold air intakes or scheduling dyno-tunes with this one like I did with the 2004. We ordered the new one with specific options that we kinda DIY`d with the last one after having it for a while so the 2019 will likely stay pretty much stock. We were somewhat unsure of the visibility with the tint we were having done so when we got to Esoteric, they grabbed some keys and had us sit in some cars with different levels of tint, both on the windshield and the other windows. In the end, we decided on 55% all the way around and actually seeing it on a car from the drivers seat was a big help. Todd (Cooperider) was on site after doing some very early morning TV spots for the Columbus Auto show and getting the chance to talk with him, Zack, Dan, Ryan, Tak and all the others there is absolutely an opportunity not to be missed if you`re at all interested in the `automotive arts`. The knowledge these folks have and are willing to share is just incredible. Coatings, PPF, exotic cars in general, detailing specifics, trends in the industry (past, present and future) were all things we touched on. Sorry for taking up so much of your time, guys...you`re just too darn nice for me to not babble on endlessly, absorbing as much info as I can. Finally heeded Margaret`s mentions of "Kurt, you need to let these guys back to work..." and headed out the door...only to realize when pulling out of the parking lot that we forgot to leave them the keys to the Corvette. Oops. Thanks to everyone at Chesrown Chevrolet, Buick, GMC, most notably Joey Gill who`s been putting up with me since last October, and the always first-class folks at Esoteric Fine Auto Finishing. It was a truly fun and memorable day...not sure actually owning and driving the new car will be as fun as the day we bought it. Budgetplan, it sounded like a great day. I`m glad you guys had a good time with everything. Yeah you can get more money. You’ll think about that experience the rest of your life. Sounds like you got a great wife.... she got stuck with a coating addicted husband! What an awesome experience for you and the wife! Thanks for shareing your day with us. Understandable that time flew by when haveing so much fun. Looking forward to see the vette finished now even more. Can only imagine the feeling you guys have to see it and driving it home. Budgetplan1- I`m glad you`re having so much fun with this! I will admit that acquiring a new toy that will require only the most limited of attention/work from me has a certain appeal to it. The prospect of picking it up and just driving it away with no OCD-ish compulsion to get the exterior protected ASAP makes the whole affair a bit more relaxing than my usual norm.